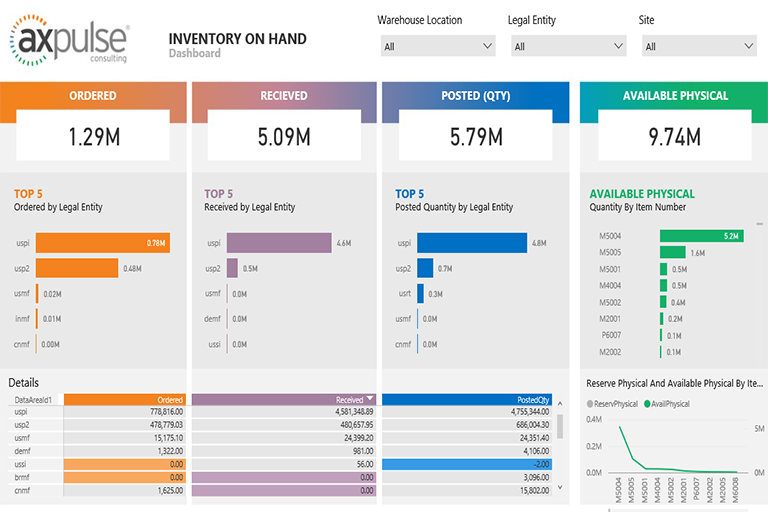 Inventory on-hand dashboard provides a detailed insight into the stock on hand data stored in Microsoft Dynamics 365 for Operations. Users can view this dashboard in their workspace in Microsoft Dynamics 365. Users can view insights like ordered quantities, received quantities and physically available stock across legal entities, sites and warehouses. They can also drill down this information per legal entity, site or warehouse. There are other visuals like physical available by product, reserved physical vs. available physical quantities comparison.